Every place of business has business cards. It serves as a reminder for people that need quick access to your phone number or address. 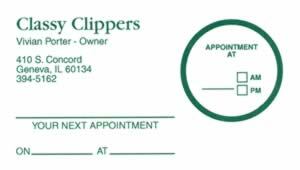 If you are a business that requires people to have appointments, these custom appointment cards are just the right type of cards for you. Every customer of yours has a busy life. It is not a hard thing to forget when there is an appointment that needs to be taken care of. 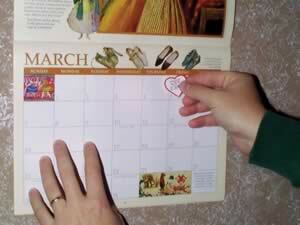 Calendars keep us on track and usually important things are written in for certain days. With these business cards with removable stickers, you almost make life easier for your customer. Simply writing in the little area what time their appointment is for so they can place this removable sticker on their calendar on the correct day. There is no need for the customer to write it in their calendar. 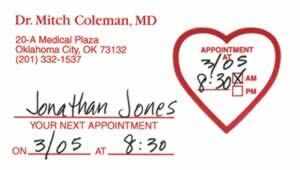 Also, this is a business card, customers will be holding onto it so they have a quick accessible way of getting their appointment date if they are not near their calendar. Since your phone number and address already appear on the card, it is also easy for your customer to let others know about your business. 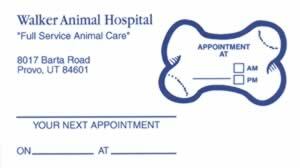 Seeing the custom shape of the dog bone or the tooth on their calendar will grab their attention and give them a quick reminder of the appointment. 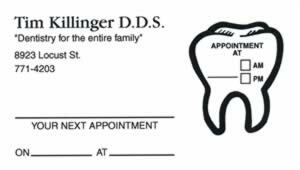 This little Appointment Business Cards with Removable Label is a sure way to know that your customer will be there for their appointment. 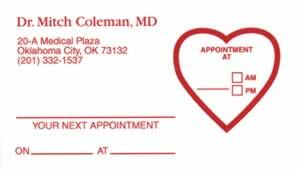 Appointment cards are Flexo-printed on White Self-Adhesive Card Stock with a Kiss-Cut-peel-off label for use as a convenient reminder. Choose up to six standard colors. 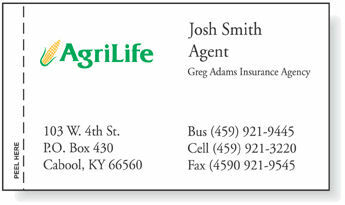 are standard business card size 2" x 3½"
Write appointment information on the card and matching label. For more information about our Appointment Cards with removable sticker, please contact customer support.